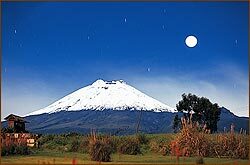 The Ecuador Hiking Adventure is held at the same time and overlaps with the Ecuador Running Adventure. It is possible for one person to participate in the Hiking Adventure and another in the Running Adventure and spend every night together. Each group has separate transportation, tour leader and guides, however we spend every night at the same haciendas and hotels. It is also possible to do either the hike or the run on any day. We can accommodate your choice! Check with us for details!